One of twin boys, Boon was the first born from Symphony in May 2011. He and his brother Neo were both sold to be breeding bucks. Boon is in Pardeeville, WI and Neo now resides in Upper Peninsula Michigan. His new owners drove nearly six hours to get him! Angel is the most recent milking doe added to the herd. This is Maggie. 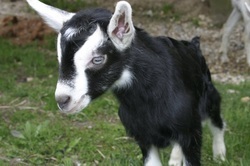 Born in April 2010, she is a purebred Oberhasli.